It’s apple picking season in my neck of the woods. Michigan is normally a large supplier of apples, but not this year. We sure took a hard hit by all the late frost. So, I’ve been a crazy lady stalker at the farmers market. Crowding to the front of the booth to get my hands on some fresh Honeycrisp Apples. I like to get my apples early in the season when they are crisp and sweet. The shortage is so bad this year I am paying over a dollar an apple. Love the pictures today Dawn and Honeycrisp are my favorites too. I sent a few pounds down to my kids in Chicago last week, the price they’re paying down there is ridiculous. Enjoy today outside, sounds like it may be our last for a long time. Such a picture perfect fall setting. Apples here are from $1.29 lb. and up depending on what type. I don’t think I have ever had Honeycrisp and have not seen them sold here. Your fall vignette is so beautiful. It belongs in a magazine, for sure. We can get Honeycrisp apples at Costco but they are pricey. All our apples are over a dollar each and we grow them in north Georgia. Your setting and vignette is gorgeous. Oh how pretty! A picture perfect scene. Wow-I LOVE your outdoor fall ‘display’! Gorgeous! Dawn, your photos are absolutely beautiful. I love your apple table! Your photos are lovely and make me want to be sitting at that table munching on a crisp apple. Nova Scotia fared pretty well this year — perhaps it’s just because we’re used to frosts. I’ve been enjoying apples as well and yup! Honey crisp are one of my favorites. The local pears this year are extremely good as well. I am a gold delicious fan but every fall I buy honeycrisp for a change. I love them. Your photos are so inspiring. The setting is perfect! Well, I bought some apples yesterday. I don’t remember how much they were. I think I’d have noticed if it were really high. But I can’t stand on my feet long yet, so I was in a hurry to move on. Beautiful pics! 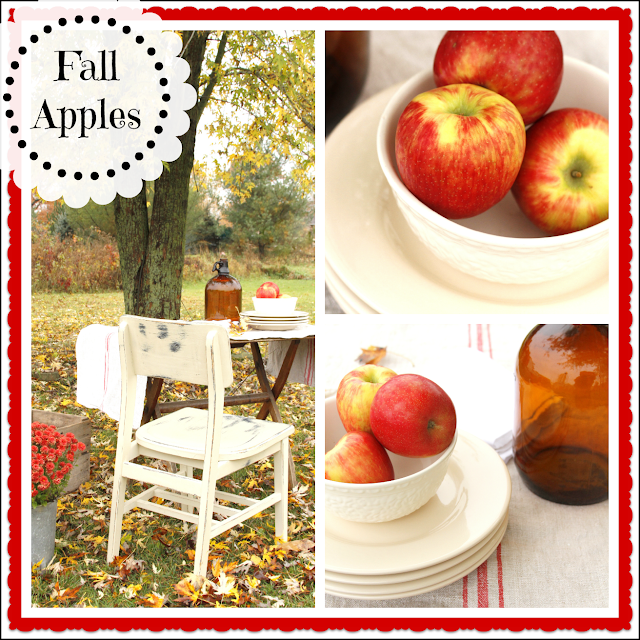 Nothing better than crisp sweet apples in the fall. I can’t seem to get enough of them. Love your photos. Wow, those look delicious! Honey Crisp is just about our favorite, but we get quite a nice selection at our Sprouts store. They always have several varieties on for 88 cents a pound. We were just looking at an apple tree last week and thinking that might be a good addition to our backyard. There are a couple of varieties that do very well here. What a simple and pretty post! I still haven’t taken my kids apple picking. After our storm today there won’t be any apples left to pick. Thanks for your well wishes – hope you are great! Great photography. Thanks for sharing. Oh this is just beautiful makes me want some apple cider and a good book to read in a picturesque setting! I showed your beautiful post off tonight at my party! Dawn, your pictures are beautiful. We have had an awlful summer, rain 5/7 days a week. All our produce has went sky high in produce. I thought it was because we lived in Northern Ontario, Canada…but I guess the weather has affected more than us. Honey crisp apples sure are good !